A Syrian family, a month from home, pauses to rest in a makeshift shelter in Croatia, as they await a train for Hungary. We cannot hide the images and stories of migration from our students, but what do we want them to learn? Image from Global Oneness Project. The fate of the Trans-Pacific Partnership. Here may be the central question for educators that arises out of the year’s news: Does the advent of Brexit and Trump foretell the decline of global identity and global citizenship? It goes without saying that many politicians in the global North and elsewhere are seeking power by invoking populist themes. In many developed nations, political passions have shifted and venerable anxieties about economics, immigration, crime have settled around the issue of national sovereignty. This means that issues such as ocean acidification and air pollution–topics which don’t privilege nationalism–are pushed aside by politicians and the press alike in favor of talk of terrorism and borders. In our everyday lives, however, we experience globalization in a number of sometimes-contradictory ways simultaneously. While politicians warn about terrorism and “open borders,” marketers and business consultants prepare brands and companies for a global marketplace and worried citizens seek relief on Facebook and Instagram. Even those that vote for nationalist candidates enjoy their access to an ever-increasing array of consumer goods and media. This isn’t hypocrisy–it’s our current condition. But how can political nationalism–or in some places religious fundamentalism–coexist with globalization in nearly every other aspect of life? From now on it is going to be: America First. Okay? America first. We’re going to put ourselves first. It is not Trump’s job to square these facts. He has business partners all over the world but his rhetoric uses nationalism and nostalgia that is exclusive and exclusionary. The rhetoric our schools use to talk about these issues matters. Are we preparing “global citizens?” Are we readying our students with “21st-century skills” to compete in a global market? The latter here appears more palatable to the powerful in American education: there is no threat to populist emotion to assert that students will be trained to outperform others from around the globe in terms of innovation and entrepreneurship. American leaders then try to thread the needle, seamlessly connecting personal and national success. On the masthead the White House’s page on education, President Obama is quoted as saying, “If we want America to lead in the 21st century, nothing is more important than giving everyone the best education possible — from the day they start preschool to the day they start their career.” In terms of primary and secondary education, the Obama White House argues that, “To create an economy built to last, we need to provide every student with a complete and competitive education that will enable them to succeed in a global economy based on knowledge and innovation.” Not empathy or justice or service, but competition and economic success. Even American progressives funnel global identity into the rhetoric of business. The key words in Finnish education policy are quality, efficiency, equity and internationalisation. The basic right to education and culture is recorded in the Constitution. The policy is built on the principles of lifelong learning and free education. Education is seen as a key to competitiveness and wellbeing of the society. Finns then don’t deny the reality of economic competition, but it isn’t rooted in a zero-sum game that leads to treating the education of the young as a race to prepare workers to fend for themselves in a cut-throat and now global race. It is clear that people’s work is interconnected as never before. Smartphones and shipping containers, logistics and free-trade zones have connected producers, marketers and consumers together as never before and these processes don’t appear to be slowing. Culturally, the same platforms have similarly linked us. My students in Oregon listen to K-Pop and Hindi Pop while teens in Korea and India watch “Game of Thrones” on Netflix. As a teacher, I am wondering where the world is headed. What skills and knowledge do my students need in order to work in a global marketplace–of ideas as well as products. And how will the shifting political and economic sands alter their sense of self, of identity? links to organizations that support global identity and citizens, especially in terms of education. Look at the age breakdown of the Brexit vote: why are young Britons apparently so much more international in outlook than those over 50? Might it suggest that the vote may someday be reversed? Is it possible to choose which globalizations we want? In other words, can we have the global flow of capital and information without the global flow of people and identities? Can teachers educate students to succeed in a global economy without altering their identity as citizens? Can we have a global economy and globalized culture without global citizenship? Are global and national identities at odds? Does an increase in one mean a decrease in the other? And does dedicating oneself to putting one’s nation “first” help or hurt people abroad? BBC News Hour, “Trade Wars: The End of Globalisation?” 25 Nov 2016. A good primer on economic globalization and its current challengers. Jim Butcher, “Global Citizens Versus the People,” Spiked, 7 December 2016. Daily Star (Lebanon), “Will the Assault on Globalization Continue in 2017?” 17 December 2016. The Economist, “The New Nationalism,” 19 November 2016. James Hitchings-Hales, “A Global Citizen’s Guide to Proper New Year’s Resolutions,” Global Citizen, 16 December, 2016. Richard M. Battistoni, Nicholas V. Longo, Stephanie Raill Jayanandhan, “Acting Locally in a Flat World: Global Citizenship and the Democratic Practice of Service-Learning,” Journal of Higher Education Outreach and Engagement, Volume 13, Number 2, p. 89, (2009). This article offers useful examples of colleges connecting the global and the local, especially in terms of service learning. Michael Byers, “Are You a Global Citizen? Really? What Does That Mean?” The Tyee, 2005. Byers is a professor of political science at the University of British Columbia. This essay may be a good way of thinking about how global citizenship is and isn’t defined. Tara Nuth Kajtaniak, “10 Key Terms for Global Education.” This handy page offers definitions for words we hear a lot, including “global citizenship,” “global competencies,” and “globalization.” It offers links to authoritative sites where many of the definitions originate as well. Jen Chavez-Miller, “Themes of Global Education in Finland,” 2015. This page looks at both the big picuture of global education in Finland as well as at a couple of specific school Jen visited as a Fulbright grantee in Finland. Kyra Garson, “Ethical Considerations for Internationalization: Perspectives from Global Citizenship Education,” Canadian Bureau for International Education, CBIE PhD Research Series, 2012. Considers the ethical dilemmas and institutional barriers to meaningful global education at the college level. Ronald C. Israel, “What Does it Mean to be a Global Citizen?” Kosmos Journal for Social Transformation, 2012. “The National (Canada) Youth White Paper on Global Citizenship.” By the Centre for Global Citizenship Education, The Centre for Global Education and TakingITGlobal, 2015. Fernando Reimers (Harvard Univ. ), “What education for what world? ” at UNESCO Bangkok, October 2015 (video), https://www.youtube.com/watch?v=XgluW0f8LkQ. Global Citizen. This is a great site for reading about global issues and for thinking about what it means to be a global citizen. It has thematic sections (Girls and Women, Education, Health, etc) and encourages activism in many ways. 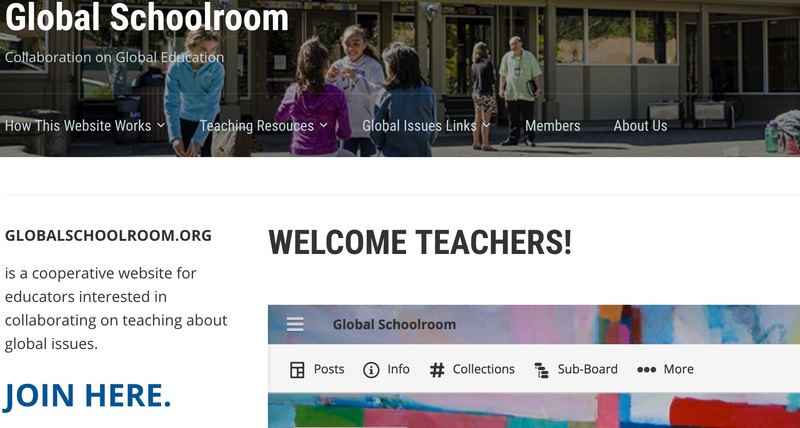 Global Collaboration Day’s Page on Global Education Resources is terrific. It has links to organizations. conferences, and other useful resources for teachers. Global Oneness Project: “Founded in 2006, the Global Oneness Project offers free multicultural stories and accompanying lesson plans for high school and college classrooms.” The materials are aligned with US Common Core standards. They are also well organized into categories including migration, climate, vanishing cultures, nature, etc. TakingITGlobal: “TakingITGlobal is one of the world’s leading networks of young people learning about, engaging with, and working towards tackling global challenges.” The site offers free, downloadable “action guides” on a series of topics, including climate change and HIV/AIDS. They are a bit out of date but offer some useful frameworks for a large-scale project. People without understanding of the other, a sense of social justice and a disregard for human rights merely exist and will continue to do so until the breath of the last one standing. Economic or competitive edge will no longer matter when the water runs dry, the earth can longer grow food or the climate scorches all. Let’s lead, live and learn now, together and for all, as if there are no tomorrows. Great list of topics to address and good resources . And the global v. nationalistic question needs far more exploration, since many students assume and have been trained to think that nationalism and patriotic fervor are always best. One key topic seems to be missing — global warming. It’s a great example of a global issue that needs local and national action. And, if you follow the UNFCCC & the annual COP meetings, it’s also a good example of how we are writing tomorrow’s ‘history’ today through our actions (or lack thereof). We have developed a calculator for schools to take inventory of their own greenhouse gas emissions [GHG], along with some background material and sources so teachers can feel comfortable taking this on, even if they don’t have a science background or credential. Like the other globalization topics you mentioned, this one deserves — almost demands — a real multi-disciplinary approach. More info about this initiative is on our website at the Alliance for Sustainable Communities–Lehigh Valley. Another issue worth looking into is the fundamental conflict of corporation-driven laws — including federal and state preemption — versus community-based democracy. This is playing out in states and communities throughout the country and is generating lots of interest. And it’s a great topic for getting students into fundamental questions about democracy, corporate rule, and how we got to the present state of affairs.